The KBS kitting facility is integrated into the Production Control module and, of course, shares data with other relevant modules of KBS. For example, all stock Movements and Allocations are monitored by Batch Traceability software. All stock involvements are costed and recorded for Accounts purposes. Management has full views of Orders and Work In Progress. Accounting is online, with Labour and Miscellaneous costs included as required by management. Reporting is online; it identifies profitability, productivity and problem areas. Data can easily be extracted to spreadsheets for further analysis. Accounts (including stock valuations) automatically updated as part of invoicing. Multi-currency accounting, including exchange difference recognition. Fully integrated with Purchasing, Stock and all other KBS modules. Purchase Order Forecast to identify shortfalls/overstocks in advance. 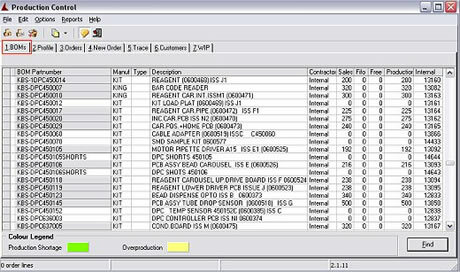 Optional Purchase Order Management module to monitor stock and generate orders and reschedules. Stock batch and serial number tracability at all levels. Additional costs (Labour, transport etc) accounting. Production Control module BOM screen. Please note: : Production Control is a value added module. It is not part of the standard KBS system.